It’s fig season! Fresh figs are one of my favourite things, and when combined with goat cheese, mint & balsamic vinegar (three of my other favourite things), the outcome is just delectable. As I have mentioned in past posts, my favourite recipes are easy, delicious and look impressive – and this recipe fits that perfectly! 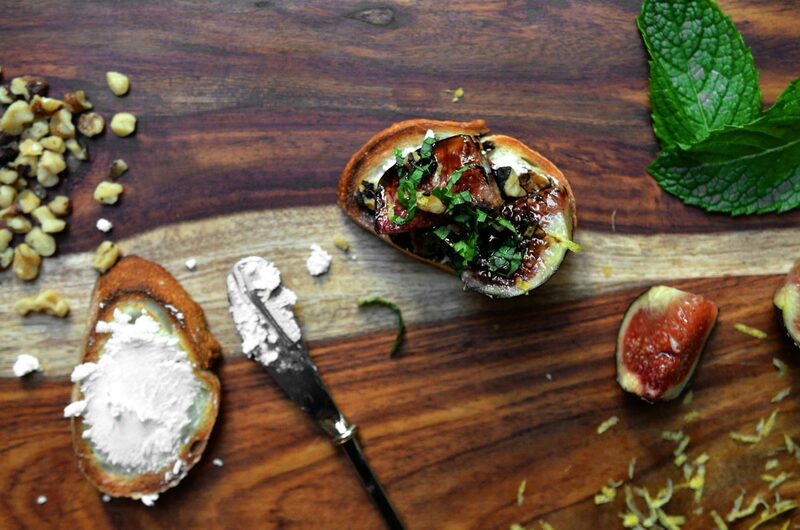 So try mixing up your repertoire next time you bring an appetizer to a summer bbq, and impress your friends with some Fig & Chevre Crostinis! *Fresh figs can sometimes be found at large chain grocers, but are more readily found at Italian or Middle Eastern specialty grocers. They have a short availability in the summer. **To make gluten free, substitute the baguette for gluten free crackers. ***A thickened balsamic glaze that can be found at some large chain grocers, such as Safeway and Italian specialty grocers. This can also be created by reducing balsamic vinegar. Spread about 1 tsp of chevre on each toast. Top with two fig slices and a sprinkle of mint, walnuts and lemon zest. Drizzle with balsamic crema and serve.